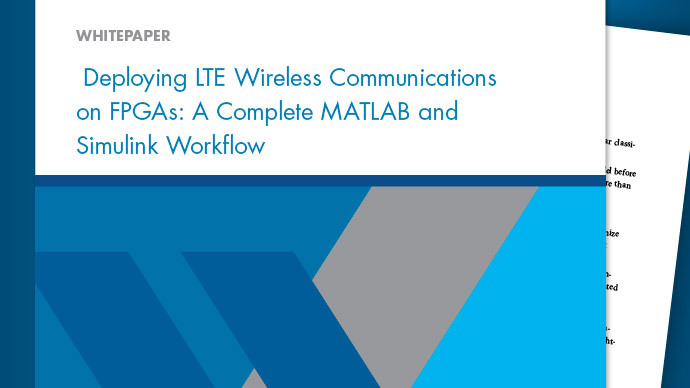 This example shows how to work with MATLAB® HDL Coder™ projects. This example helps you familiarize yourself with the following aspects of MATLAB HDL Coder™ projects. At the end of each section take a note of the UI menus and windows and perform any tasks required in the example before moving to the next steps. This is an introductory example that shows various UI elements of MATLAB HDL Coder project workflow. For more advanced coding examples and other workflow tasks refer to other MATLAB HDL Coder examples. The MATLAB code used in the example is a simple symmetric FIR filter. The example also shows a MATLAB testbench that exercises the filter. % We can reduce the complexity of the FIR filter by leveraging its symmetry. % prior to performing the multiplication. It is always a good practice to simulate the design with the testbench prior to code generation to make sure there are no runtime errors. To create a new HDL Coder project, click the Apps tab. Under Code Generation, select 'HDL Coder'. The selection opens the following dialog. Alternatively, you can also create a project from the MATLAB command prompt using the following command. The following HDL Code Generation UI panel will appear in the MATLAB desktop after the previous step. In addition a new file called 'sfir_project.prj' is created in the current folder. This file holds all the project selections made in the UI. Drag the file 'mlhdlc_sfir.m' from the Current Folder Browser into the Entry Points tab of the HDL Coder UI, under the "MATLAB Function" section. Drag the file 'mlhdlc_sfir_tb.m' into the HDL Coder UI, under "MATLAB Test Bench" section. Alternatively you can use the hyperlinks in the 'HDL Project UI Panel' to browse to the files and add them to the project. You can leave the input argument types 'Undefined' for the MATLAB Function. 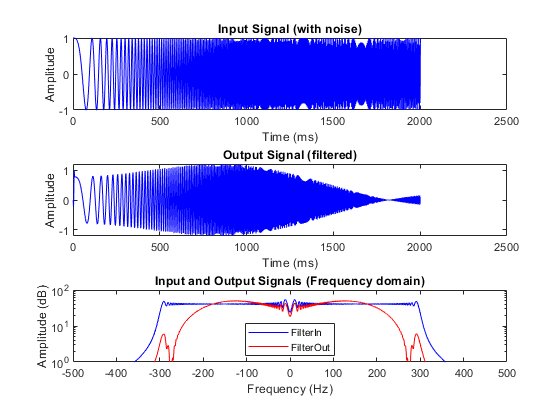 The input types are automatically inferred from the MATLAB Test Bench. 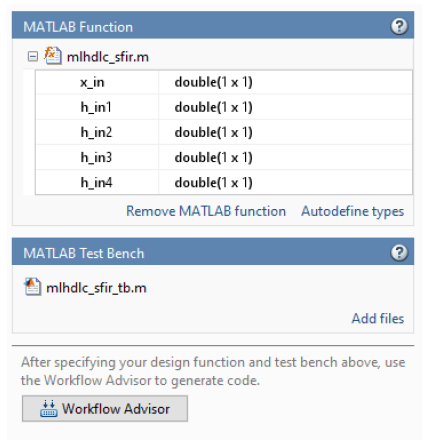 Click on 'Workflow Advisor' button to bring up the MATLAB HDL Coder workflow advisor dialog. Right click on the 'HDL Code Generation' step and choose the option 'Run to selected task' to run all the steps from the beginning through the HDL code generation. The Workflow Advisor will transform your MATLAB design to fixed-point and then generate HDL from the fixed-point design. Examine the generated fixed-point code from the floating-point design by clicking on the hyperlinks in the 'Type Validation Output' window to open the generated fixed-point MATLAB code in the MATLAB editor. Examine the generated HDL code by clicking on the hyperlinks in the Code Generation Log window.